Bolection has become a vastly popular fireplace. It has been trending for hundreds of years in reality. 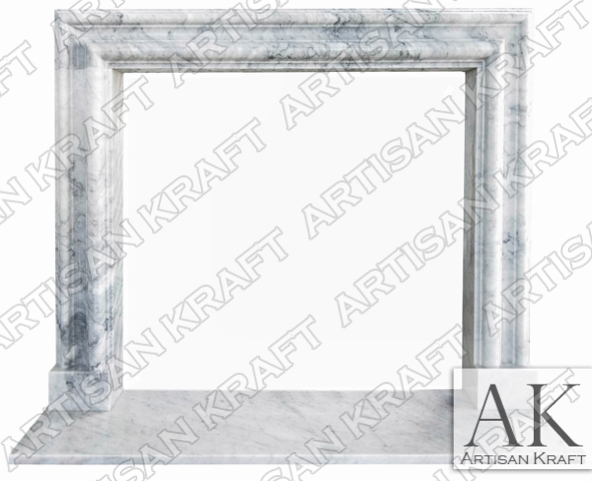 This actual design is a replica of French Antique mantels found throughout historic French Chateaus and Palaces. This speaks greatly of the lasting design that this frame surround has. Here the Bolection surround is pictured carved from Exotic Arabescato Marble. Exotic Arabescato is an Italian marble. This is a highly exclusive stone that comes from Italy. It looks similar to Carrara but is a much higher quality. This surround is part of our exclusive Black Label Collection. This is our high end collection of exceptionally crafted fireplace mantels.